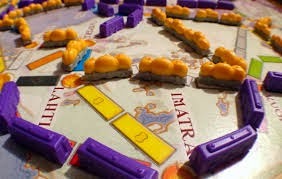 I am a rabid fan of all things in the Ticket to Ride Universe. The so-addictive-you-can't-stop-playing-to-eat game is a cross-country train adventure in which players collect and play matching train cards to claim railway routes connecting cities throughout North America, Europe, Germany, Asia, Africa, India, Switzerland and the Nordic Countries! The longer the routes, the more points you earn. Additional points come to those who can fulfill their Destination Tickets by connecting two distant cities, and to the player who builds the longest continuous railway. While I prefer the board game, I am also addicted to the Ticket to Ride for iPad. Last year Days of Wonder launched a special Halloween tricked-out version featuring a haunted train station, pumpkin train cars and killer skins. 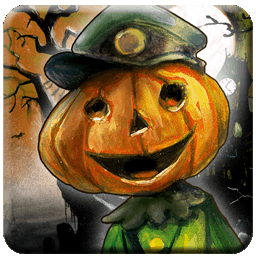 Players could compete to become a Ghost Catcher” or a “Pumpkin Master”. Last Christmas, in addition to receiving the new Africa Maps, my wife gave me the Halloween Freighter Train and Station set. I have been waiting all year to pop the seal and play a spooktacular game. For those of you who play Ticket To Ride and want some way of making you trains stand out I would recommend getting this nice cheap set. If any of you play ticket or wish to try it, send me a note via email or on Twitter so we can to play a game in the flesh or on-line.